ไม่แน่ชัดว่าครูมากน้อยเพียงใดมีความเข้าใจผิดเกี่ยวกับ 0 คณะนักวิจัยจากมหาวิทยาลัยมิชิแกนไม่ได้ตีพิมพ์เผยแพร่ข้อมูลสำหรับคำถามแต่ละคำถาม เบตตี ลิชเทนเบิร์ก (Betty Lichtenberg) ผู้ช่วยศาสตราจารย์การศึกษาคณิตศาสตร์แห่งมหาวิทยาลัยเซาท์ฟลอริดา ในการศึกษาปี 2515 รายงานว่าเมื่อกลุ่มครูโรงเรียนประถมตามแผนได้รับการทดสอบจริงหรือเท็จซึ่งมีคำถามหนึ่งว่า "0 เป็นจำนวนคู่" ครูเหล่านั้นคิดว่าเป็น "คำถามลวง" โดยสองในสามตอบ "เท็จ"
การทดลองซ้ำ ๆ ต่างแสดงว่าผู้รับการทดลองช้าที่เลข 0 ไม่ว่ามีภูมิหลังอายุ สัญชาติ หรือภาษา หรือไม่ว่าเผชิญกับชื่อเลขในรูปตัวเลข สะกดเป็นอักษร และสะกดในภาพกระจก แต่กลุ่มของเดอแอนพบปัจจัยแยกกันปัจจัยหนึ่ง คือ ความชำนาญทางคณิตศาสตร์ ในการทดลองของพวกเขาครั้งหนึ่ง นักศึกษาในเอกอลนอร์มาลซูว์เปรีเยอร์ (École Normale Supérieure) ถูกแบ่งเป็นสองกลุ่ม กลุ่มหนึ่งศึกษาวรรณคดี และอีกกลุ่มหนึ่งศึกษาคณิตศาสตร์ ฟิสิกส์ หรือชีววิทยา ความช้าที่เลข 0 "พบโดยสำคัญในกลุ่ม [วรรณคดี]" และที่จริง "ก่อนการทดลอง ผู้รับการทดลองบางคนไม่มั่นใจว่า 0 เป็นคี่หรือคู่ และต้องได้รับการย้ำนิยามทางคณิตศาสตร์"
ด้วยต้องอาศัยความคุ้นเคยอย่างมาก เหตุนี้จึงทำลายสมมติฐานการคำนวณในใจอีก ปรากฏการณ์ดังกล่าวยังแนะว่าการรวม 0 อยู่ในการทดลองเปรียบเทียบจำนวนคู่และคี่เป็นกลุ่มนั้นไมเหมาะสม การศึกษาหนึ่งระบุว่า "นักวิจัยส่วนใหญ่ดูจะเห็นตรงกันว่า 0 ไม่ใช่จำนวนคู่แบบฉบับและไม่ควรสืบสวนมันในฐานะส่วนหนึ่งของเส้นจำนวนในใจ"
↑ Penner 1999, p. 34: Lemma B.2.2, The integer 0 is even and is not odd. แพนเนอร์ใช้สัญลักษณ์คณืตศาสตร์ ∃ ตัวบ่งปริมาณสำหรับตัวมีจริง ในการระบุข้อพิสูจน์: "To see that 0 is even, we must prove that ∃k (0 = 2k), and this follows from the equality 0 = 2 ⋅ 0." ↑ Lichtenberg 1972, pp. 535–536 "...numbers answer the question How many? for the set of objects ... zero is the number property of the empty set ... If the elements of each set are marked off in groups of two ... then the number of that set is an even number." ↑ Lichtenberg 1972, pp. 535–536 "Zero groups of two stars are circled. No stars are left. Therefore, zero is an even number." ↑ Dickerson & Pitman 2012, p. 191. ↑ Lichtenberg 1972, p. 537; compare her Fig. 3. "If the even numbers are identified in some special way ... there is no reason at all to omit zero from the pattern." ↑ Lichtenberg 1972, pp. 537–538 "At a more advanced level ... numbers expressed as (2 × ▢) + 0 are even numbers ... zero fits nicely into this pattern." ↑ Caldwell & Xiong 2012, pp. 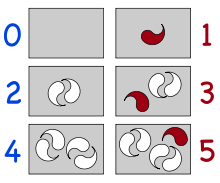 5–6. ↑ Gowers 2002, p. 118 "The seemingly arbitrary exclusion of 1 from the definition of a prime … does not express some deep fact about numbers: it just happens to be a useful convention, adopted so there is only one way of factorizing any given number into primes." For a more detailed discussion, see Caldwell & Xiong (2012). ↑ Penner 1999, p. 34. ↑ 15.0 15.1 Berlinghoff, Grant & Skrien 2001 For isolated vertices see p. 149; for groups see p. 311. ↑ Frobisher 1999, pp. 37, 40, 42; results are from the survey conducted in the mid-summer term of 1992. ↑ Frobisher 1999, p. 41 "The percentage of Year 2 children deciding that zero is an even number is much lower than in the previous study, 32 per cent as opposed to 45 per cent"
↑ Frobisher 1999, p. 41 "The success in deciding that zero is an even number did not continue to rise with age, with approximately one in two children in each of Years 2 to 6 putting a tick in the 'evens' box ..."
↑ Frobisher 1999, pp. 40–42, 47; these results are from the February 1999 study, including 481 children, from three schools at a variety of attainment levels. ↑ Frobisher 1999, p. 41, attributed to "Jonathan"
↑ Frobisher 1999, p. 41, attributed to "Joseph"
↑ Frobisher 1999, p. 41, attributed to "Richard"
↑ Keith 2006, pp. 35–68 "There was little disagreement on the idea of zero being an even number. The students convinced the few who were not sure with two arguments. The first argument was that numbers go in a pattern ...odd, even, odd, even, odd, even... and since two is even and one is odd then the number before one, that is not a fraction, would be zero. So zero would need to be even. The second argument was that if a person has zero things and they put them into two equal groups then there would be zero in each group. The two groups would have the same amount, zero"
↑ 44.0 44.1 Ball, Lewis & Thames 2008, p. 27, Figure 1.5 "Mathematical claims about zero." ↑ Ball, Lewis & Thames 2008, p. 16. ↑ Dickerson & Pitman 2012. ↑ Hill et al. 2008, pp. 446–447. ↑ Ball, Lewis & Thames 2008, p. 15. See also Ball's keynote for further discussion of appropriate definitions. ↑ Nuerk, Iversen & Willmes (2004, p. 851): "It can also be seen that zero strongly differs from all other numbers regardless of whether it is responded to with the left or the right hand. (See the line that separates zero from the other numbers.)" ↑ ดูข้อมูลทั้ง Dehaene, Bossini & Giraux (1993), และสรุปโดย Nuerk, Iversen & Willmes (2004, p. 837). ↑ Dehaene, Bossini & Giraux 1993, p. 376 "In some intuitive sense, the notion of parity is familiar only for numbers larger than 2. Indeed, before the experiment, some L subjects were unsure whether 0 was odd or even and had to be reminded of the mathematical definition. The evidence, in brief, suggests that instead of being calculated on the fly by using a criterion of divisibility by 2, parity information is retrieved from memory together with a number of other semantic properties ... If a semantic memory is accessed in parity judgments, then interindividual differences should be found depending on the familiarity of the subjects with number concepts." ↑ Grimes 1975, p. 156 "...one can pose the following questions to married couples of his acquaintance: (1) Is zero an even number? ... Many couples disagree..."
↑ Sones & Sones 2002 "It follows that zero is even, and that 2/20/2000 nicely cracks the puzzle. Yet it's always surprising how much people are bothered by calling zero even..."; Column 8 readers 2006a "'...according to mathematicians, the number zero, along with negative numbers and fractions, is neither even nor odd,' writes Etan..."; Column 8 readers 2006b "'I agree that zero is even, but is Professor Bunder wise to 'prove' it by stating that 0 = 2 x 0? By that logic (from a PhD in mathematical logic, no less), as 0 = 1 x 0, it's also odd!' The prof will dispute this and, logically, he has a sound basis for doing so, but we may be wearing this topic a little thin ..."
↑ Arsham 2002; The quote is attributed to the heute broadcast of October 1, 1977. Arsham's account is repeated by Crumpacker (2007, p. 165). ↑ Sones & Sones 2002 "Penn State mathematician George Andrews, who recalls a time of gas rationing in Australia ... Then someone in the New South Wales parliament asserted this meant plates ending in zero could never get gas, because 'zero is neither odd nor even. So the New South Wales parliament ruled that for purposes of gas rationing, zero is an even number!'"